At child care centers and primary schools, the DollsVilla by Liliane® is used to stimulate group and solitary play, the social-emotional and language development. Between four to six boys and girls can play together at the same time. Each day, the children can add to the stories they invent, ad infinitum. Sometimes children are even allowed to bring their own dolls and cars from home; this provides them with an extra sense of security. 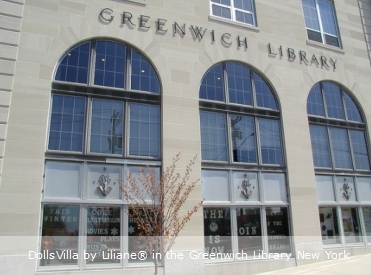 The DollsVilla contributes to their desire to go to the nursery and the school. "I am lucky enough to have one of your houses in school, love it 7 years on & still as good as new. We love ours a lot!" | Kierna Corr | nursery teacher Ireland. The nurseries of Kindergarden belong undeniably among the finest in the world. The meticulous design of the nurseries exude tranquility and quality and respect. Children can really switch off of turbulence here and can partake of many recreational experiences. Breathtaking. DollsVilla by Liliane® in the Kindergarden Stad, near the Royal Theatre Carré Amsterdam. 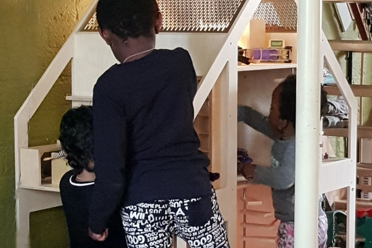 “The refugees-children of the language class at our elementary school are very happy with the DollsVilla by Liliane®” – Natasja Hoegee | Coordinator and teacher Taalklas Houten The Netherlands. 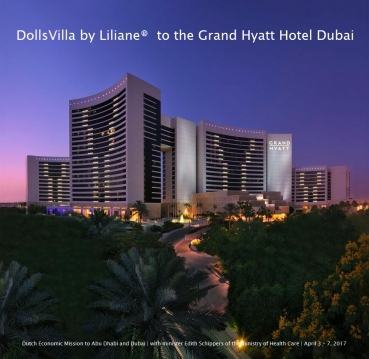 After a feel and experience period with two samples of the DollsVilla’s by Liliane® the Grand Hyatt Hotel Dubai is so excited that she likes to own and permanently offer the villa's to her junior guests. Children can play with each other for many hours in the Kidz Club and in the brunch restaurant of the Grand Hyatt, even if they can not communicate in the word languages. The DollsVilla tops the quality list, according to Ineke en Ingrid Stemfoort: "We worked as primary school teachers and over 20 years we have seen lots of play equipment. However, this beautiful, thoughtful, decent DollsVilla by Liliane® tops our quality list !!". USA Scoop². For the first time a DollsVilla by Liliane® leaves for New York, after San Francisco, California [et alia]. And for the first time the DollsVilla makes her entrance in a US-nursery. Thanks to the kids’ design - distributor Moon Picnic. 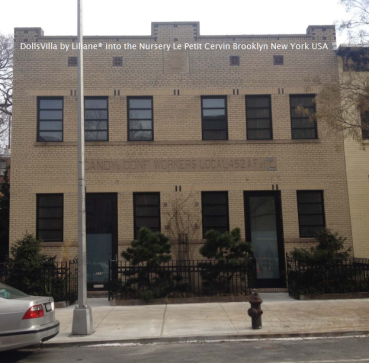 Children of the beautiful Le Petit Cervin in Brooklyn NY - play | live with all your heart! Lionel Messi and his dogs just arrived - from Barcelona - in the DollsVilla by Liliane® for an excellent night's sleep. 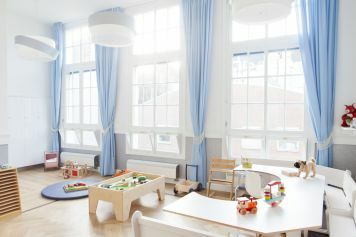 Located in the beautiful, new nursery Small | district of The Hague in The Netherlands. The British International School in Warsaw acquires a DollsVilla by Liliane® for her children from 2½ to 7 years. The acquisition is a result of a economic delegation, which had taken place in June 2014 in parallel with the state visit of King Willem-Alexander and Queen Maxima. The British International School in Warsaw is part of Nord Anglia Education, a worldwide leader in providing high quality, innovative education to thousands of students across the globe. Supported and directed by a team of educational experts, Nord Anglia Education’s Schools are located in Asia, USA, Europe and the Middle East. "I am lucky enough to have one of your houses in school, love it 7 years on & still as good as new. We love ours a lot!" 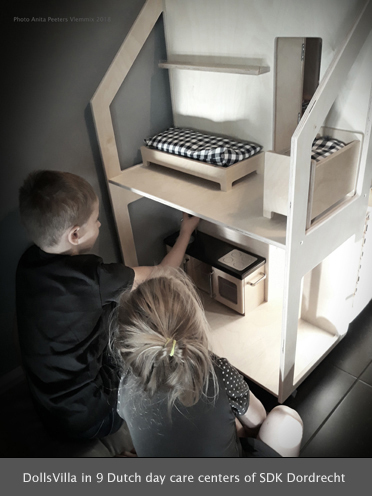 Elisa Spaander, the contact person for Out of school care says: "When we provide tours to educational professionals who are thinking about setting up an Out of School Child Care Centre, their eyes light up when they see the DollsVilla by Liliane®. Our children love to play with the DollsVilla by Liliane®, it encourages interaction among the children. And it's extremely durable: after almost a year of daily use, all the parts are still intact." Janneke Meijsen, a teacher at a primary school: "The DollsVilla by Liliane® is incredibly popular. During every free lesson the home [that is what I call it, because it makes it more attractive to the little boys] is always occupied by two to three children. Whenever the children are given free playtime, at least two or three children line up for the villa. The kids love it!!! My compliments." Hanneke Jansen, working at the nursery Toermalijn | MIK Maastricht: "The DollsVilla by Liliane® had its first overhaul just yesterday. After zeven years there was just one loose wheel. Otherwise everything else is perfectly intact, despite children playing with it very intensively. The DollsVilla by Liliane® is hugely popular. Here at the Out of School Centre, children can choose between three rooms, and the room with the DollsVilla by Liliane® is almost always the winner!" Do toys actually deliver to child care centres what the manufacturers promise? Every month the trade journal for the day-care sector publishes a short survey in which day-care centre staff review toys or playground equipment. 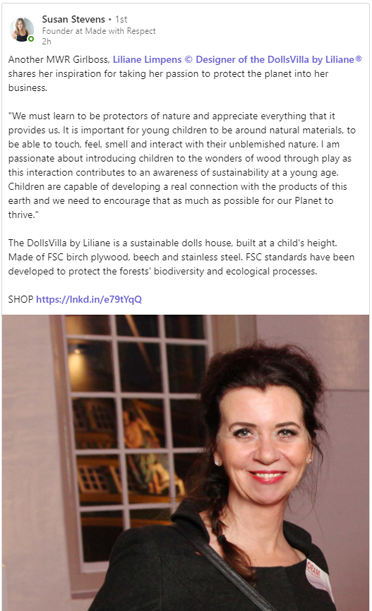 Staff: "Children from four to about six or seven years of age play with the DollsVilla by Liliane® a lot. Boys play with the villa too. They use it as a garage for their cars. The villa looks great and the kids can access it from all sides. Toddlers love it too. They play with the building itself and the furniture rather than the dolls. The accessories from the villa are also used in other kinds of games. Sometimes the villa is used as a climbing frame. It is sturdy enough. So it’s thumbs up all around. At first, we were afraid it would be too big – but because it’s easily movable, it’s never really in the way." 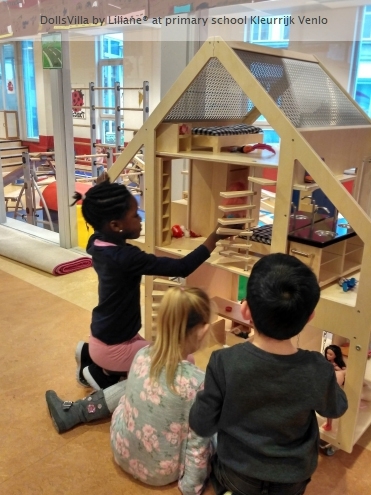 Dutch Foundation for Child Day-Care Centres | SKON: "The DollsVilla by Liliane® is included in the basic inventory for extracurricular day-care centres. While the villa might at first seem expensive, it is typically an item of furniture for playing with that distinguishes SKON. Children don't have this at home." The 10 Italian branches of schoolsupplier LUDO VICO have started to sell the villa to nurseries and elementary schools: "We are enthusiastic. Visitors like the DollsVilla by Liliane® so much and they really appreciate both the design and the quality." 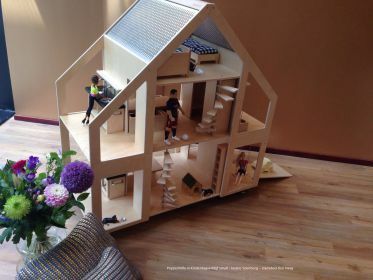 'PLAYING HOUSE: The DollsVilla by Liliane® from ASCO is large enough for several children to play with at the same time'. ■ PuppenVilla® by Liliane - das ideale Puppenhaus für jede Kindertagesstätte. ■ Spielbegeisterung bei Jungen und Mädchen und allen Altersklassen. ■ Mobil einsetzbar im ganzen Haus. ■ Qualität, die Langlebigkeit verspricht, machen den Preis - auch bei knappen Budget - vertretbar." 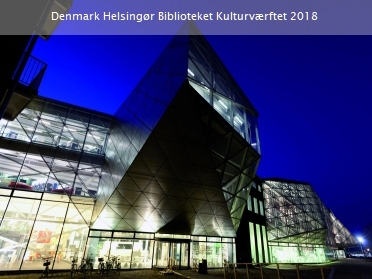 In 2003, the director of ASCO Educational Supplies in the UK, Tom Marshall, said: "Yesterday we delivered our first DollsVilla by Liliane® here in Leeds. As it was a local customer we agreed to assemble the villa for them. It is the first time I have assembled one and I just want to say that I am very impressed with the way it fitted together, the clarity of the instructions and the quality of the finished article. The customer is one of a major chain of nurseries and they were absolutely delighted with it."